An Ivanpah power tower receives the day’s first rays of sunlight in the Ivanpah Valley about 45 miles southwest of Las Vegas. The Clark Mountain Range in the Mojave National Preserve rises behind the plant. Photo by Phil Taylor. Nearly 6,190 birds died at the Ivanpah solar energy plant in Southern California's Mojave Desert in its second year of operation, a 77 percent increase over the estimated fatalities from the previous year. The estimate by Western EcoSystems Technology Inc. (WEST), a contractor for the plant, is bringing fresh scrutiny to solar "power tower" facilities built to turn the sun's heat into electricity. Two have been built on public lands in the U.S. Southwest with billions of dollars of federal loan assistance, and others are in development in Chile, South Africa and China. "It's an unbelievably high number, and we're really alarmed," said Garry George, renewable energy director for Audubon California. "We have a lot of questions about this mortality report." An earlier contractor, H.T. Harvey and Associates, performed the first-year mortality analysis and found that 3,500 birds likely died at the facility in the year beginning October 2013 (Greenwire, April 24, 2015). But WEST said comparisons between the two reports are "not appropriate." In fact, when adjusting for bird migration patterns, the actual number of bird deaths likely did not rise significantly at Ivanpah between the first and second year, according to WEST. That's because the H.T. Harvey report did not account for the full migration season in fall 2014 and because its sampling of the facility occurred during the plant's phased startup, which resulted in a reduced number of surveys, WEST said. In addition, researchers have new data on searcher efficiency, which refers to the percentage of dead birds that are actually seen by human surveyors, and "carcass persistence," which refers to how many dead birds are carried away by scavengers. Power towers use thousands of mirrors known as heliostats to concentrate sunlight onto tall, central receivers that heat water to create steam and turn a turbine. 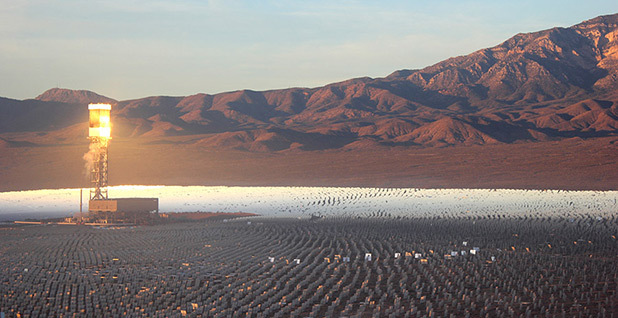 At Ivanpah, the largest plant of its kind when it came online in 2013, birds have been incinerated in midflight after entering the searing-hot solar field. Many hundreds of others have died after colliding with the mirrors and other objects. In order to provide "a meaningful comparison across years, especially for migratory species," the WEST report offered an alternative analysis that was based on "biologically informed seasons." That analysis estimated that about 5,128 birds died at Ivanpah in year one and 5,181 birds died in year two. In year two, an estimated 2,500 deaths were from known causes -- of those, 46 percent were attributed to "singeing" and 54 percent to collisions. Species most often found dead at Ivanpah were the yellow-rumped warbler (87), followed by the mourning dove (73) and greater roadrunner (72). Searches were performed in the winter and summer season roughly every 21 days and in spring and fall season roughly once a week. The project's impact on birds remains minor, WEST concluded. "Overall, based on the monitoring results and estimates for known and unknown causes for the 2014-2015 monitoring year, the effect of the project on birds will not rise above the 'low' category," it said. Deaths from solar plants are likely small compared with building collisions, which kill an estimated 365 million to 988 million birds annually in the United States, according to a 2014 study by federal scientists in the journal The Condor: Ornithological Applications. Stray and outdoor pet cats each year kill a median of 2.4 billion birds and 12.3 billion mammals, mostly native mammals like shrews, chipmunks and voles, according to a 2013 report from scientists from the Smithsonian Conservation Biology Institute and the Fish and Wildlife Service. Yet bird deaths at Ivanpah are technically illegal under the Migratory Bird Treaty Act, which bars the unpermitted killing of more than 1,000 bird species. The Fish and Wildlife Service has enforced the law only in limited circumstances where it feels companies have ignored steps to minimize avian impacts. FWS Director Dan Ashe has previously praised Ivanpah's efforts to minimize its harm. David Knox, a spokesman for plant operator NRG Energy Inc., said no federally threatened or endangered birds have been killed at Ivanpah in its first two years of operation. "The report shows that patterns and numbers of avian fatalities have remained consistent throughout the first two years of monitoring at the facility when biologically informed seasons are examined," he said. "Because our goal is to minimize any wildlife impact, we continue to work diligently on evaluating mitigation efforts to further decrease avian mortality." The plant continues to experiment with "humane avian deterrent systems" similar to what airports use, he said. They include the installation at all three power towers of BirdBuffer, a moving box-size machine that sprays a concentrated grape juice extract into the air that smells foul to birds. A sonic deterrence system known as Bird Gard has also been installed at the units to scare away migratory species. "The chemosensory deterrence measure is hypothesized to deter resident species, since the deterrent induces a conditioned response over time, and the sonic deterrence measure is hypothesized to deter transient and migrant species, as the sounds produced by the system are thought to startle and deter subjects," the WEST report said. Ivanpah is also using software to reposition the heliostats to reduce the level of elevated heat and minimize collisions, replacing conventional lighting with LEDs that are not attractive to insects and help reduce the prey base for birds, and installing anti-perching devices. Knox said he's not sure when, or whether, the plant will be able to release any studies that analyze the effectiveness of these deterrent methods. "The challenge is establishing an accurate baseline in such a dynamic environment so you know whether decreases are a result of deterrents or natural changes in the environment or, more likely, some combination of the two," he said. Earlier this week, researchers at the U.S. Geological Survey released a study that concludes video cameras may be the best way for solar developers to track birds, bats and insects that fly near solar power towers and are a key tool to understanding how the massive facilities affect wildlife (Greenwire, July 28). George of Audubon California said the organization will continue to oppose power towers until more is learned about their impact on birds and how that harm can be mitigated. The new mortality estimate underscores the need for the Bureau of Land Management to finalize its Desert Renewable Energy Conservation Plan (DRECP), he said. The plan unveiled by BLM in November would designate "development focus areas" within 10 million acres of federal desert land in California where utility-scale renewable energy projects will be encouraged, while barring development in other areas where solar plants would conflict with wildlife habitat and recreation (E&ENews PM, Nov. 10, 2015). "Ivanpah is like the Altamont of solar," George said, referring to the troubled wind farm in California known as Altamont Pass, which is noted for causing a high rate of eagle deaths. "This is why we need the DRECP." BLM is expected to finalize the plan in the coming weeks.